What types of food do the Amish can be simply answered by knowing what they grow. Nearly anything and everything that is a vegetable or fruit and some meats can be canned. What might surprise most non-Amish people is that meat can also be canned. The Amish as a people are very hard workers, this can be seen in their abundance of canning and their beautiful custom Amish quilt.. The manner in which the Amish can their food items is the same way the frontier Americans did over 100 years ago. The food itself, whether corn, beans or apples will be boiling in a brim and immediately placed in a clean jar and sealed with a metal or glass lid. By placing the ingredients hot in the jars, it will take up more space than if at room temperature. With the lid on tight, a vacuum will be created as the food cools. This is how it is preserved and will not go bad overtime because it will not be exposed to outside air and bacteria. With meat products that are to be canned, the heating process fully cooks the meat. This has two purposes. The first is that the meat will not spoil while in the jar. The second is that it can also be eaten without it having to be reheated. Many of the Amish cure or smoke their meat before it is put thru the canning process. This is so the flavor they desire will be captured in the meat. During the summer months, the Amish only pick the vegetables and fruits they will server that day at the meal. This way no refrigeration is needed to keep them fresh. As the harvest season approaches, so does the canning season. This way they will have fruits and vegetables for the long cold winter months. What is exactly canned each year is then dependent on what was grown. Cabbage is turned to sauerkraut before it is canned. Other vegetables are stored with specific herbs and spices that have been time honored tested by each Amish family over the years. Sorghum is a crop that many Amish families grow. The syrup that is made from this plant is used similar to maple syrup. It can be canned and stored for use in the winter. Surprising it is also a favorite of many survivalists because of the mineral and nutrient content it contains. Personally my father use to mix it with butter can place it on bread as a type of desert. What most people forget to realize is that canned goods are still in use today by the masses. The most common of these is the pickle. Every cucumber, that makes the transformation to a pickle, both dill and sweet, will be boiling in a brim and then packaged. As it cools the vacuum is formed until the lid is opened. These cans of pickles, along with all other food items that are persevered in this fashion will not only last the winter and still be edible, but also taste good. In many instances, the canned food can actually last several years if needed. In Stock ready to Buy Now! Amish Quilter. 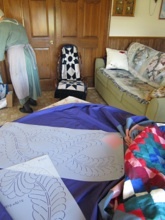 Custom Amish Quilts - All of our quilting is done by hand. Visit the Amish Quilter online shop. We also have over 100 Beautiful traditional readymade Amish Quilts for sale.